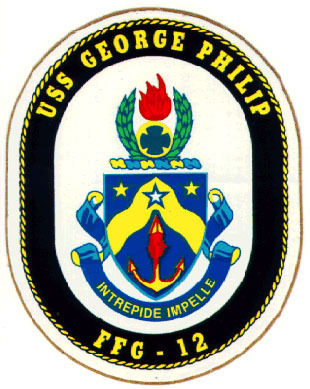 The USS GEORGE PHILIP, an Oliver Hazard Perry Class guided missile frigate, is named in honor of Commander George Philip, Jr., USN (1912-1945). Commander Philip, born in Fort Pierre, South Dakota, on 14 April 1912, attended South Dakota School of Mines in Rapid City before his appointment to the U. S. Naval Academy. After completion of the course of instruction at the Naval Academy, he was commissioned an Ensign on 6 June 1935. Ensign Philip continued to progress in grade until his promotion to Commander on 4 September 1944. During this period he served under a variety of commands including: USS MISSISSIPPI (1935-37), USS CALIFORNIA (1937-38), USS ELLET (1938-40), USS O'BANNON (1942-43), and Operational Training Command, Pacific Fleet, San Diego, California (1943-44). He then served as Commanding Officer of USS TWIGGS (1944-46). Commander Philip established a skilled fighting reputation while simultaneously serving as the Executive Officer, Navigator and Combat Intelligence Officer of the famed O'BANNON. For his conspicuous gallantry during the crucial stages of the Soloman Island Campaign, Philip was awarded the Silver Star Medal and O'BANNON received the Presidential Unit Citation. Commander Philip was posthumously awarded the Navy Cross for extraordinary heroism while commanding TWIGGS during an 84-day period of combat near Okinawa. He died following a dusk attack by a Japanese kamikaze aircraft on 16 June 1945. 15 November 1980: USS GEORGE PHILIP commissioned at Todd Shipyard in San Pedro, California. November 1980 - June 1981: Sea trials and testing. June 1981: Received the Battle "E" award for excellence. July 1982 - February 1983: First deployment in support of USS ENTERPRISE battle group. 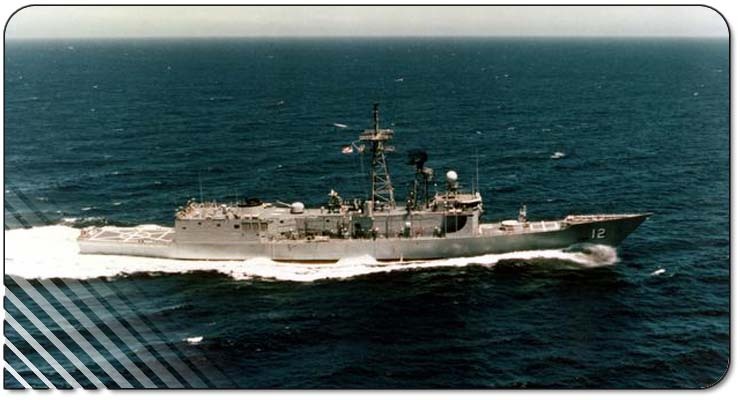 September 1984 - March 1985: Second deployment in support of U. S. efforts to keep sea lanes open in the Persian Gulf during the height of the Iran-Iraq war. June 1985: Transfer to the Naval Reserve Force (NRF). As a member of the NRF, the ship turns its focus to the training and readiness of Selected Reservists. The ship goes from full manning to 60% manning, whit the remainder made up of Reservists. June 1985 - June 1987: Engineering and weapons readiness examinations and inspections. Training for helicopter pilots. December 1987 - June 1989: Overhaul at Southwest Marine in San Diego. While in overhaul the ship receives major upgrades in Anti-Submarine Warfare (ASW) capabilities. The ship is fitted with a Tactical Towed Array Sonar (TACTASS), widely recognized as very effective equipment in submarine detection. June 1989 - May 1992: Extensive ASW operations and test platform for the new ASW equipment. May 1992 - August 1992: Third deployment in support of efforts to counter drug traffic from South America to the United States. August 1992 - June 1994: Various independent operations and port visits that include: San Francisco; Seattle; Vancouver, British Columbia; and Mazatlan, Mexico. July 1994 - October 1994: Fourth deployment in support of efforts to counter drug traffic from South America to the United States. October 1994: Escorted towing of former USS RICHARD B . RUSSELL (SSN 687) to Bremerton Naval Station. The Shield: Dark blue and gold are the colors traditionally associated with the Navy and are symbolic of the sea and excellence. The stars represent three Pacific Island campaigns -- the liberation of the Philippine Islands; the conquest of Iwo Jima; and the capture and occupation of Okinawa -- during which Commander Philip commanded USS TWIGGS (DD-591). The blue star, voided white, refers to the Silver Star awarded to Commander George Philip, Jr., for gallantry while serving aboard USS O'BANNON in the Solomon Islands. The wavy chevron suggests thrust and movement from a strong base that characterized the Pacific campaigns. The barbed and enflamed anchor symbolizes naval firepower and alludes to the Navy's progressive sweep through the Pacific Islands during World War II. It further typifies the capabilities of guided missile frigates. The Crest: The dark blue screwiest refers to the Navy Cross posthumously awarded to Commander Philip. He gave his life when his ship, USS TWIGGS, was damaged from a Japanese torpedo and kamikaze attack off Okinawa in June 1945. The fire bomb symbolizes military prowess. The laurel wreath symbolizes the victory in the Pacific for which Commander Philip gave his life and the great honor and respect he earned throughout his naval career.